Alliance for Responsible Mining - Samlerhuset Group B.V. The Samlerhuset Group has teamed up with the Alliance for Responsible Mining in a bid to highlight the problems faced by artisanal and small-scale gold miners in some of the poorest parts of the world. Gold mining is a vital source of income for many communities in Latin America, Africa and Asia. Around 90 per cent of the world’s gold miners work in artisanal and small-scale mines and often face difficult conditions, working with simple tools and regularly using damaging amounts of mercury, a substance which is dangerous for the workers and presents an environmental hazard if not handled responsibly. 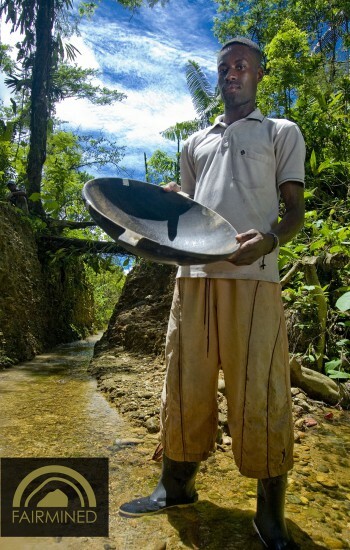 The Alliance for Responsible Mining (ARM) is working to transform artisanal and small-scale mining into a social and environmentally responsible activity by supporting miners in reaching Fairmined Certification. To be Fairmined certified the miners must meet strict requirements for responsible practices to deliver social development and ensure environmental protection. The jewelry industry has already come quite far with their initiatives to promote responsible supply chains, but the coin industry has some catching up to do. Samlerhuset and the Mint of Norway hope that they can help open more eyes to the problems faced by gold miners around the world. In 2015 Samlerhuset and the Mint of Norway minted the Nobel Peace Price medal in Fairmined gold.